Roland's Joinery was established in 2000 as the family business of Roland and Brigitte Oberlader, who moved to British Columbia from their native Austria in 1999. Roland is a certified European Journeyman who started his apprenticeship in July 1986. After finishing his Journeyman ticket, he worked for a custom cabinet shop building high-end residential and commercial cabinetry all over Europe and the Middle East. Roland's Joinery has built a name for itself in the Bulkley Valley -- a name that stands for quality, craftsmanship, reliability and attention to detail. After various expansions, Roland's 4,000-square-foot shop is now equipped with the newest state-of-the-art equipment. He only uses the highest quality materials, and doors, drawers and other components are custom-made with attention to detail. Finishing is done using the latest techniques and equipment to provide the customer with the highest-quality finish available. If you are in the market for custom cabinetry that will stand the test of time, please contact us. What is the custom woodwork advantage? Many people ask us what the difference is between the custom cabinetry we build and off-the-shelf cabinets you can buy at larger retailers. This is an important question, and one we’re happy to answer. There are as many styles of cabinets as there are customers. Commissioning custom cabinetry gives you the freedom to create the unique vision you have for your home. 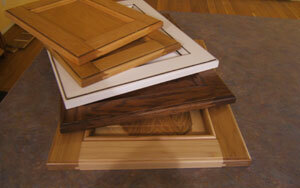 Select from wood species ranging from maple to hickory. Choose your favourite cabinet style, such as shaker or raised panel. Add details like beading or custom crown moldings. Then, finish it all off with your choice of stain (Don’t forget the countertop!). The result is a product that is entirely yours. Our small production business means we build each piece by hand using materials that are proven to stand the test of time. 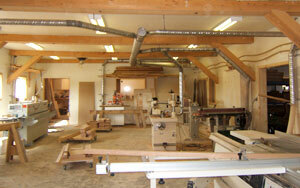 The result is quality and craftsmanship unmatched by factory made cabinets. We use only ¾ inch sheet stock and heavy duty hardware such as drawer slides and hinges. These differences may not be immediately visible to the untrained eye, but they become evident over the years when your cabinets look – and work – as good as new. When you commission cabinets from us, you will deal with the same person at every step of the process – from the initial consultation to the final installation. Our relationships with our customers don’t end there. We’re here in the Bulkley Valley for the long run, and if you ever have questions about the work we did you will always know where to find us.